Scoliosis? How to detect it? Treatment? Scoliosis ? What Is It? Scoliosis is a side to side curvature of the spine which is most often first noted in childhood. When viewed from behind, the spine should be straight. In both cases the curvature develops slowly, usually during the growth years from age 12 to 16. In severe cases, the spinal curvature may be disfiguring and cause the rib cage to compress the heart and lungs causing them to work improperly. Detection is essential if treatment is to be effective. Because the spine continues to grow until into the early 20s, if left uncorrected it often worsens. Once the curvature is fully developed, correction by any means becomes much more difficult and serious complications are more likely. If your child has not had a chiropractor examine their spine, it would be wise to arrange that by the time they reach age 12. This would include a detailed physical examination, and if warranted, x-rays.In the meantime here are several things to look for.While standing behind your child, check the level of the ears, shoulders and hips. Each pair should be approximately equal.Have the child bend forward. The spine should be straight as they bend, not veer to either side and both sides of the rib cage should be at approximately the same level.Pay attention to any symptoms your child reports such as "growing pains", fatigue, or back or leg pain. Scoliosis may not cause any symptoms so a thorough chiropractic examination may be required. What Can Be Done?If scoliosis is present or suspected, your child's spine should be reassessed at least at 6 month intervals. 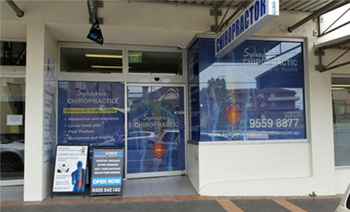 Your chiropractor is able to determine which approach to treatment is most advisable. Chiropractic care may include spinal adjustments, exercise and postural and activity advice. Severe cases are referred for additional care.Chiropractic care maintains the mobility of the joints of the spine and allows the spine to develop normally.Proper treatment can prevent progression of the curve and may help reduce it. With scoliosis particularly, an ounce of prevention is worth a pound of cure.